There are some characteristics of a piece of pottery you should have some background on if you are going to invest your money in what you believe is a real original piece. The first thing I do is determine how old the piece is supposed to be then I will start to look for some characteristics that make me believe the piece is old and not a reproduction or a fake. As shown by the four pictures below the first thing I want to look at is the bottom of the piece. Everyone looks at the bottom first regardless of where they are at and regardless of what they know. Seems to be a reflex action anymore. As you can see the bottoms of the first two pieces are clean with very white outer rims which is the area the piece sets on. Now these pieces was described as original McCoy Aunt Jermima cookie jars. since this particular cookie jar was made in the late 30s to early 40s then the bottom should have quite a bit of dirt ground into the rim the piece sets on. It could be possible the piece was kept in the original box all those years but then again I would have to see the box. Pieces from the major potteries such as McCoy, hull, and Roseville especially the early pieces had a distinct feel and weight to them. Clay has certain characteristics from different regions of the country and one of those characteristics is weight. New pieces will not have the same weight unless they were made in the same area using the same clay and techniques as was used sixty years ago. Weight is an important factor in pottery and one of the clues for detecting a fake or a reproduction. Of course we can't go aorund with a set of scales in our pockets but once you understand the factor of weight in the detection of fakes it will be much easier to spot a piece that is to lgiht. 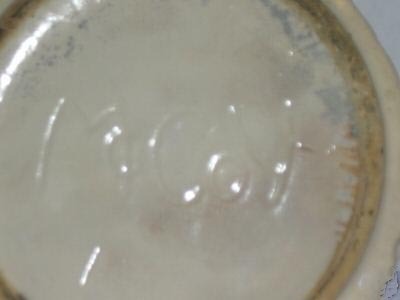 The next area to look for in pottery is the condition and texture of the glaze on a piece of pottery. 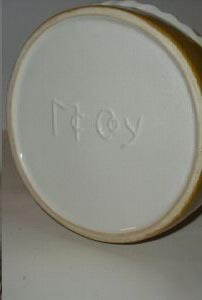 McCoy and Hull were two companies that experimented with different types of glaze through the years. Roseville principally stayed with the pastel dull glazes whereas the other companies used different glazes. Although the smaller companies have their share of fakes Roseville I believe would have the most since their pieces always command the higher prices. 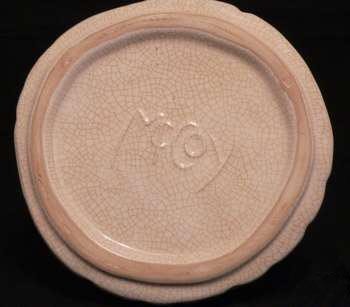 McCoy pottery glaze was in most cases good quality with some sloppiness on the bottoms of the pieces. A piece of pottery without some imperfections that relate to the pottery you collect should be a sign to look further before buying. Look at the inside of a vase or any other opening in a piece of pottery. Certain companies always had distinct glazing procedures that affected the inside of a piece of pottery. 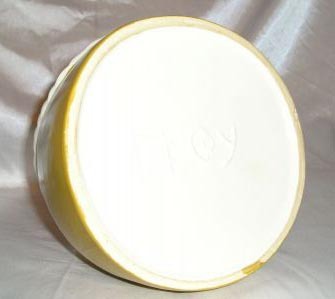 The inside may be fully glazed or there may be no glaze at all inside the piece. We have looked at weight and glaze and now lets move on to the signatures of pottery. Contents of this web site and all original works are copyright ©2005-2013 E LEWIS All rights reserved. The material on this site may not be reproduced, distributed, transmitted or otherwise used, except with the prior written permission of owner." "You are not permitted to copy, broadcast, download, store (in any medium), transmit, show or play in public, adapt or change in any way the content of these web pages for any other purpose whatsoever without the prior written permission of the site owner."